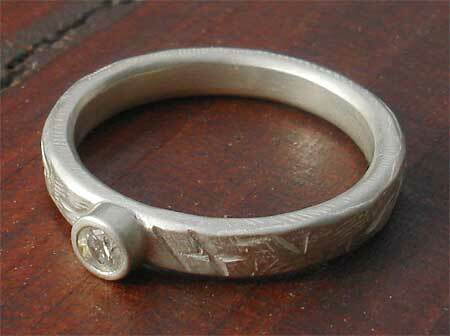 Sterling Silver Designer Engagement Ring : LOVE2HAVE in the UK! A sterling silver engagement ring with fantastic designer styling featuring a white diamond for ladies who want something unique. 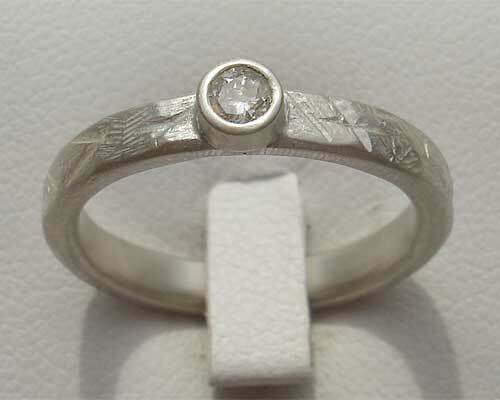 The engagement ring is set with a 10pt (3mm) white diamond in a collet and has a handmade textured surfacing. These type of textures look almost scuffed when they come out of the box with their pitted hammered styling. They maintain their look through everyday wear and tear so if your ring accidentally scratches it is virtually unnoticeable and blends in with the designer appearance. Its approximate width is 3mm, and a plain matching wedding ring is also available. The matching plain silver ring sits nicely together with the engagement ring to make an unusual choice as a wedding ring too. Please contact us for further details if you require the plain ring also. We are increasingly noting a downturn in customers ordering engagement rings made from gold due to the high prices. However, our silver engagement rings are far more affordable. Precious stone(s) Available: 1 x 10pt (3mm) white diamond.